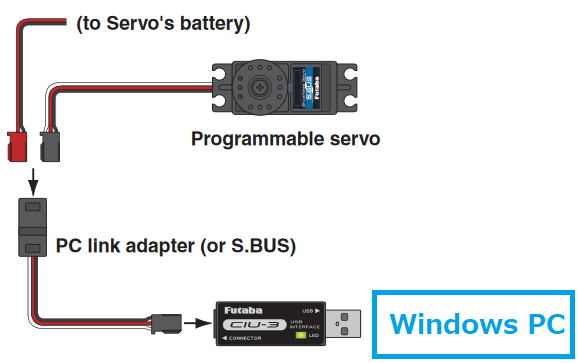 Futaba SBus/SBus2 servos accept the serial SBus protocol and can be controlled by ArduPilot once connected to the flight controller’s “SB” port or any other serial port. Up to 16 servos can be daisy chained together meaning that instead of each servo being directly connected to the flight controller, only a single serial connection from the flight controller is required. The transmission rate is 100K baud. Each servo’s ID needs to be set to a number from 1 to 16. The number chosen should correspond to the servo number used to configure and control the servo from within ArduPilot. For example if the ID is set to “9”, the SERVO9_MIN, SERVO9_MAX, SERVO9_FUNCTION, etc parameters will be used to configure the servo. Set the SERIAL2_PROTOCOL = 15 (“SBUS servo out”) if using Telem2. For other serial ports use the appropriate SERIALx_PROTCOL parameter.